This is the second article in a series for chorus directors and music teams. This article is a companion to a video that HU produced in 2016. Barbershop chorus singing has two variables that have great effect on acoustic output: riser placement and venue. This article discusses the science behind riser placement. I make a distinction between formation (mixed parts vs. sectional) and placement (how close you stand to other singers). The Lombard Effect: the tendency for speakers to increase the pitch and volume of their speech as the ambient noise increases. Self-to-Other Ratio notes that the closer choristers stand to each other, the less of an ability they have to monitor their own personal singing output. The closer you stand to another singer, the less you hear yourself (Self-to-Other Ratio), and the louder you are likely to sing as a result (Lombard Effect). Most singers in this environment respond by singing with a pressed sound to an increase in loudness - which, in turn, can affect intonation . The acoustic result of Circumambient and Lateral spacings is, in many cases, a 2-3 decibel change in the aggregate energy in overtones over Close spacing. The effect was particularly noticeable in the frequency range of overtones sensitive to the human ear, called the singer’s formant region. Human ears can detect a change of 1 decibel, thus the change in acoustic energy is noteworthy. This decibel change occurs in choruses of all compositions: men’s, women’s, and mixed choruses. Inter-singer spacing greater than 2-ft appears to decrease the quantity of decibel change, thus losing some of the benefits of space. This might be due to reverse Lombard Effect where singers feel isolated and unwilling to sing with full energy of tone. Participating singers reported in the increased spacing more efficient vocal production (due to decreased Lombard Effect) and the ability to hear and monitor themselves singing (Self-to-Other Ratio). 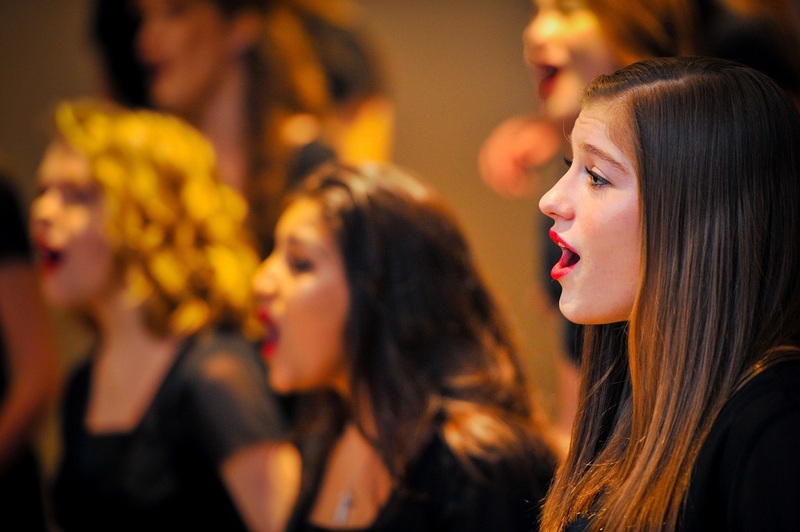 Expert listeners reported that choral ensembles with more spacing appeared to sing more in tune. To implement the Lateral spacing, place the left hand on the right shoulder of the next singer with no bent elbows. Note that the front row may need to stand slightly closer than two feet, and the back row may be slightly more than two feet apart. Your chorus size and/or riser availability can affect the degree to which you can implement these strategies. Certainly a 140-singer chorus will not be able to achieve the 2-ft spacing in either the Circumambient or Lateral spacing techniques. Variations can include having a double row of singers on the floor, extending singers on either side off the risers, adding additional steps to the risers, and experimenting with varying widths of inter-singer spacing. Work with the singers to find the optimal spacing. Some singers may feel like they are singing alone; move that singer closer to the next person. Another singer may feel like they are competing with the next singer; move them slightly farther apart. Changing the way singers have been accustomed to standing for decades can be challenging, even daunting. Have patience as singers and directors experiment.